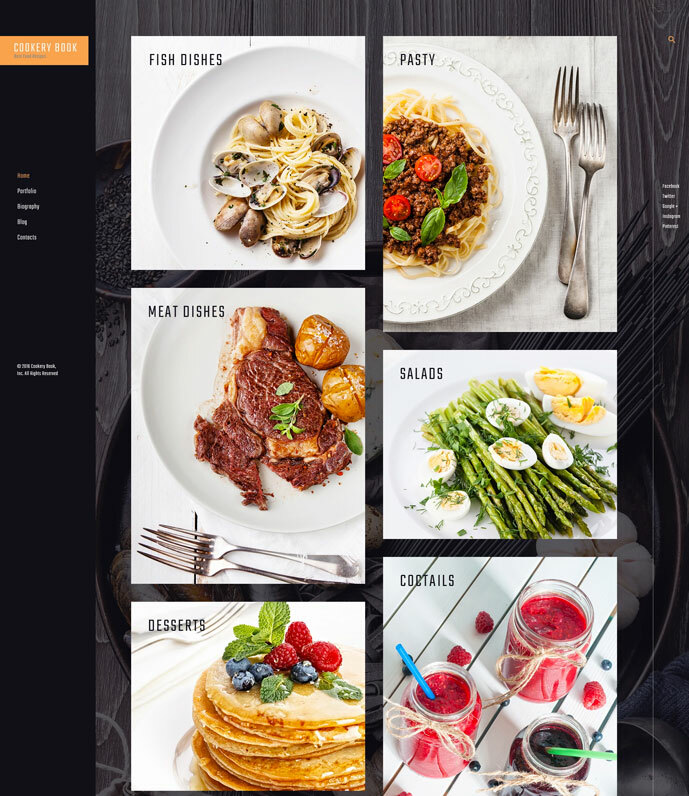 Best 30 Food & Restaurant WordPress themes of this spring: 100% responsive, cross-browser compatible, feature-rich, SEO- and Conversion-optimized. Ideal to build a food-related website that rocks! Food websites are more and more mouthwatering year after year. This year, they amuse you not only with great Parallax-powered and animated designs, but also with extended functionality that is the number one booster of user experience on the website. Moreover, modern websites mind not only aesthetic purposes, but are also conversion optimized. By this, they bring you higher revenues and help you acquire substantial audience of loyal time-tested clients. 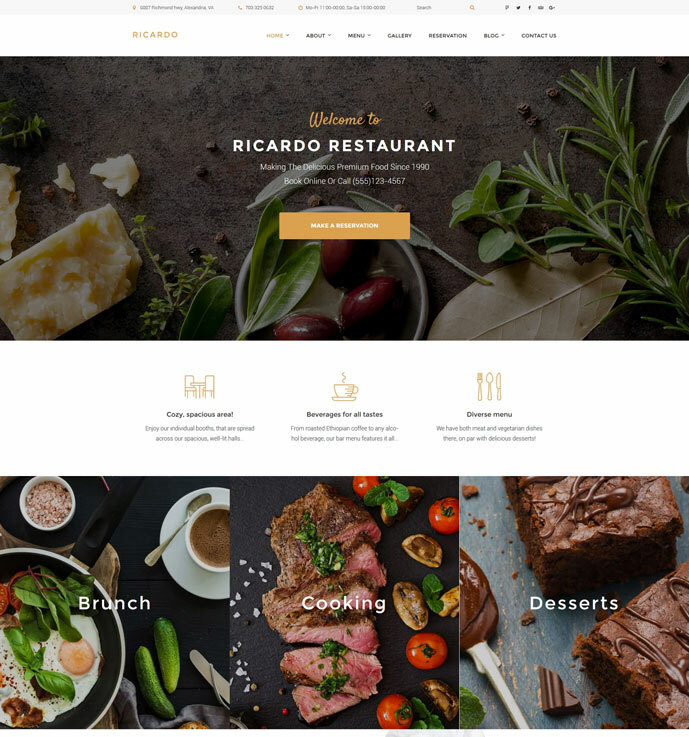 In this post, you’ll find the bright and appetizing collection of top 30 awesome food & restaurant templates that reflect upon web design trends of this year and offer a top-notch look for your website, as well as its rich functionality. These templates were skillfully created by the team of TemplateMonster, one of the well-acclaimed companies on the global template market. 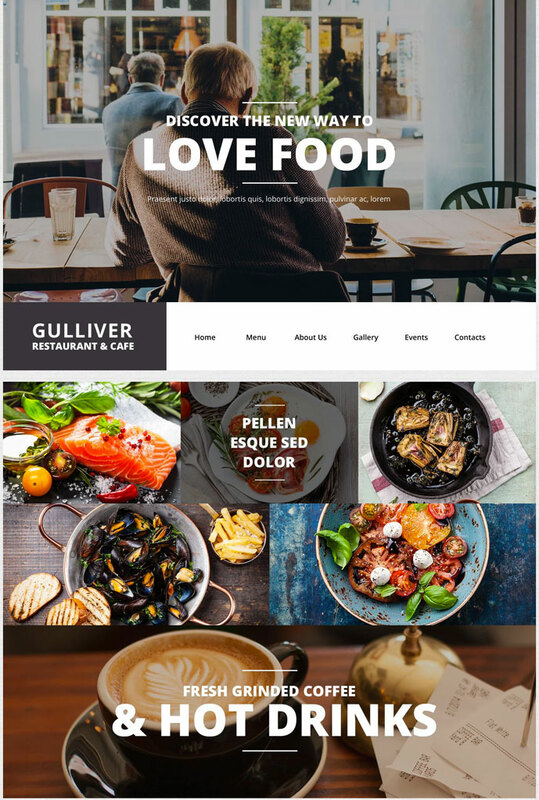 They have over 15 years of experience behind their backs and have a clear vision of how Restaurant WordPress themes of 2017 should look and function. All the themes presented in this post run on WordPress CMS that brings you simplicity married into extendibility. WordPress is the CMS #1 in the world, as it powers about 27% of all the existing websites (find more WordPress popularity stats here). WordPress templates are naturally SEO-friendly and reassuringly secure; they can be extended with one of the 47,000+ plugins available on the net and offer you automated installation and intuitive management. 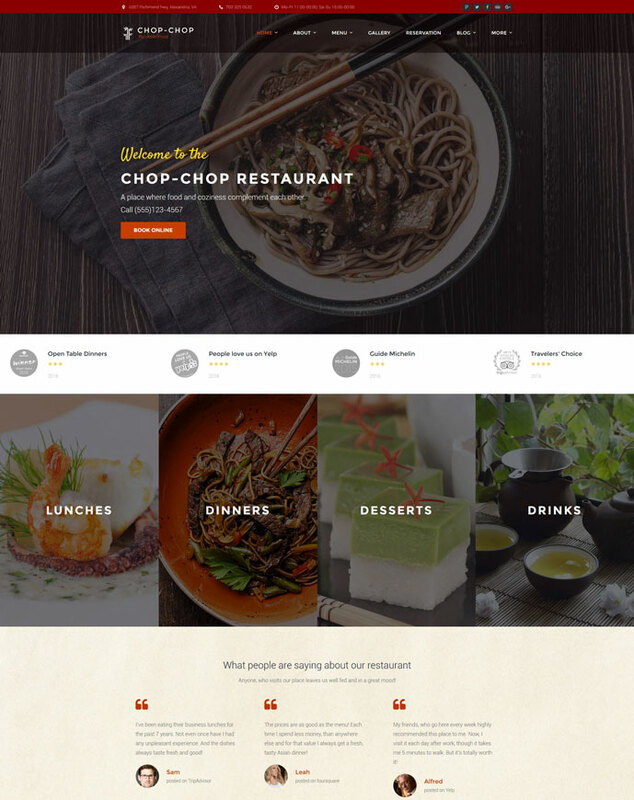 It’s time to check out top 30 food & restaurant templates that made it to the top this year. To learn more about the template you like, check out the ‘Details’ link for more information about template features and technical requirements, and ‘Live Demo’ that shows how the template will look and function right after you install it. Let’s start! Do you target creating an outstanding, memorable food website that is a pleasure to browse? 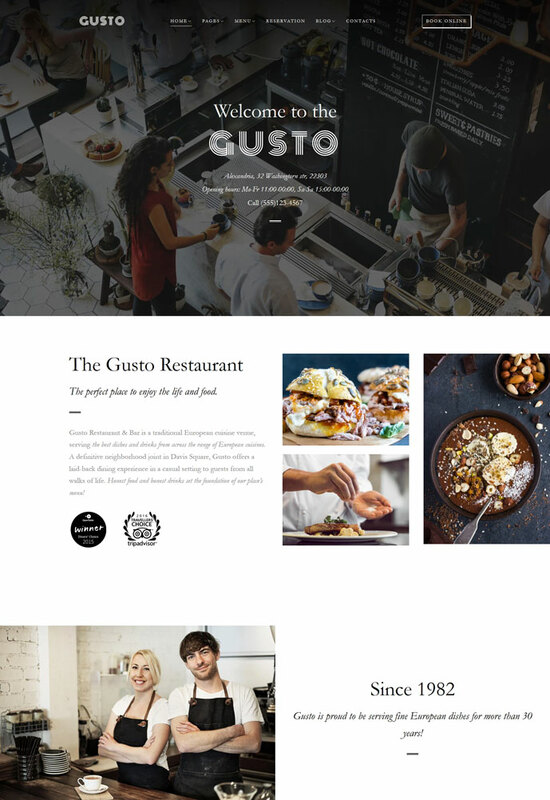 Meet Gusto Bistro WordPress template that lets of create a beautiful café, bistro or restaurant website. 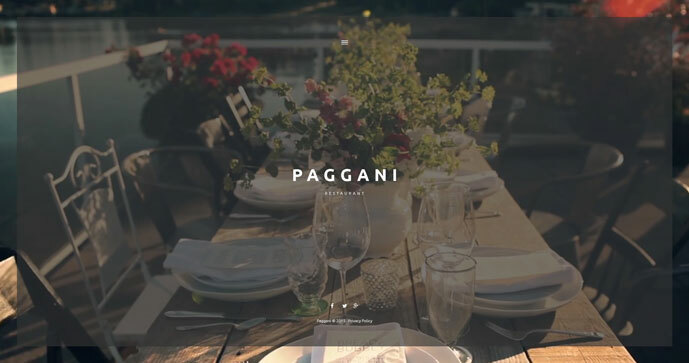 Beautiful imagery with Parallax effect makes site guests hungry to dig deeper into your website. Minimalist, elegant style and exquisite readable fonts provide for experience that is not overloaded with visual noise but perfectly meets the purposes of your website. Tell the full story of your business and present the amenities you offer on the number fully-featured ready-made pages, such as About, Out Team, Services, Menu and Reservation. Use Restaurant Menu page to skillfully present delectable dishes you offer and highlight their unique qualities. Reservation page lets your visitors submit reservation requests and choose the seats that they like most. 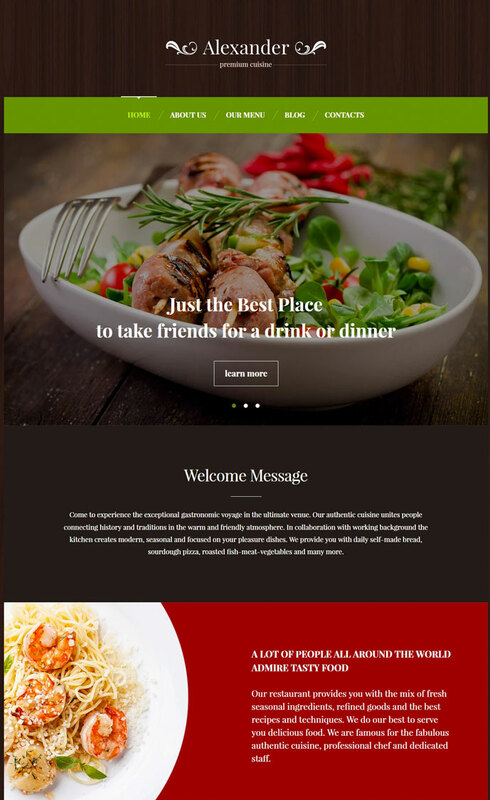 The appearance of this Bistro WordPress theme is highly customizable. It offers you a library of layouts for every taste, Cherry Sidebars plugin lets you switch between different sidebar displays, TM Style Switcher powers changing template color scheme in a matter of minutes. There are more options and features to explore, so go for this theme and you’ll launch the website you dream of! This Recipe and Food Blog WordPress theme has a clean, fresh and appetizing design that brings your content to the foreground and gives your website unique feel and appealing look. The layout of the blog section is clean and uncluttered. Thanks to powerful Bootstrap grid, your website automatically rebuilds on smaller screens and is equally appealing, no matter what the size of the viewport is. In addition to perfect responsiveness, the template is also cross-browser compatible. No matter what modern browser your site guests use, your website is rendered in a consistent way. 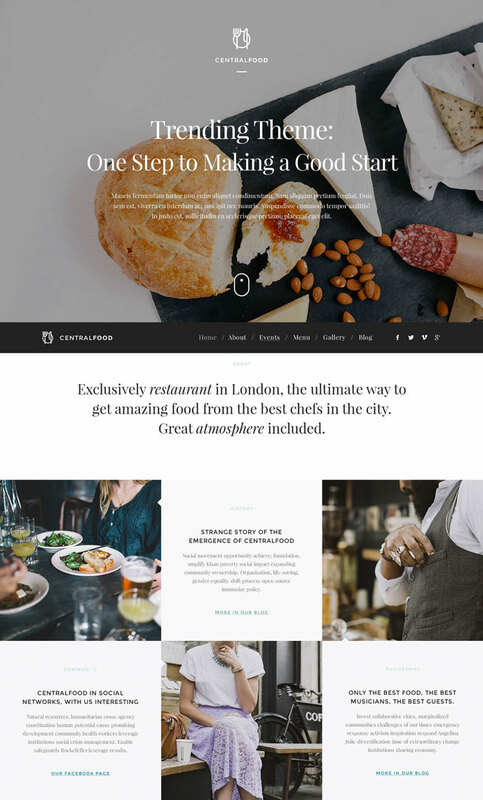 This Recipe & Food Blog WordPress themes is packed with a vast set of inbuilt premium widgets that serve for versatile and visually-rich content presentation. Among them you’ll find such handy widgets as post carousel, simple slider, image grid, category tiles, etc. Use these widgets and WYSIWYG WordPress Live Customizer to build your website and see how changes take place without reloading the page. 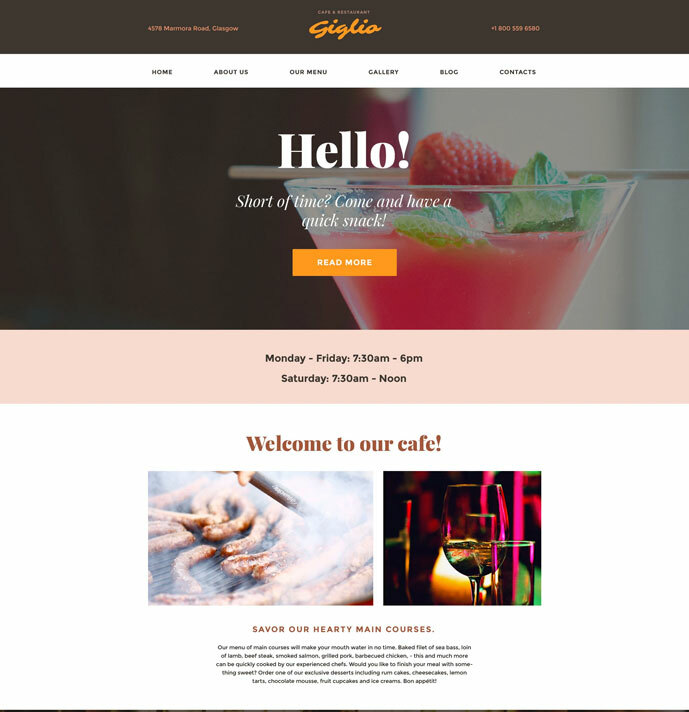 If you need a modern website for your grill restaurant, burger or steak house, go for Grilly that is specifically tailored for fire-adorned cuisine. List your grill dishes and drinks with Moto Restaurant Menu plugin. With this plugin you can not only create menu-centered pages, but also add menus to posts and sidebars with the help of shortcodes. Moto Restaurant Menu lets you provide all the information about the dishes clients may inquire. Each dish is displayed with the name, description, price, nutritional data, ingredients and characteristics, such as weight and size. The plugin, as well as the overall template design, is optimized for mobile viewing with Bootstrap 3 Framework. The ease of the template customization is ensured thanks to Power Builder and Live Customizer visual editors. The former accounts for working with layout and contents, and has a drag-n-drop interface. The latter provides you with multiple handy options that you can tweak and see the result without saving and reloading the page. Italica is not just a theme for one website, but a collection of 7 niche-specific, fully-functional themes for different niche restaurants. 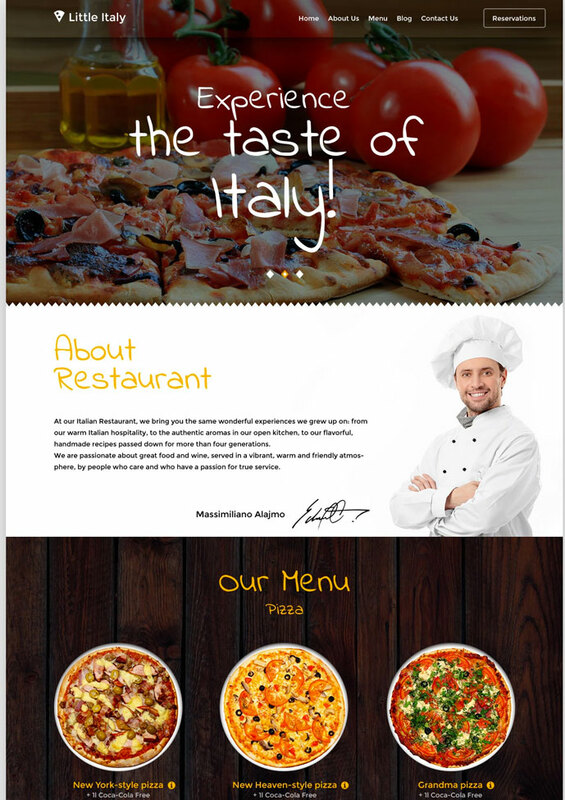 In the package, you’ll find the themes for Italian, Chinese, Japanese, Seafood, Kocher, Barbecue, and Fast Food restaurants, so this one template literally equals to 7 separate templates. With it, you can power as many websites as you wish on an unlimited number of domains, as the template comes under GPlv3 license. 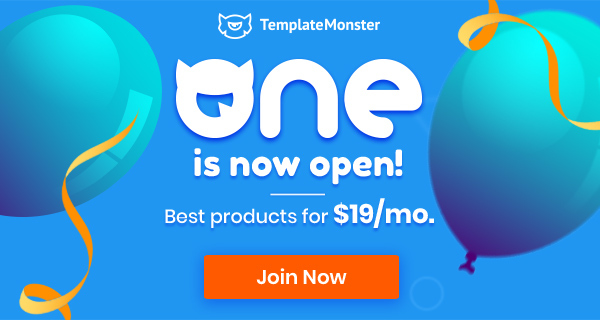 Working with the template, you’ll find a number of handy content modules that you can utilize to create buttons, blurbs, pricing tables, call-to-action buttons, countdown timers and other elements. With Appointment manager plugin site guests can see the tables that are available at this or that time point and book one directly on you website. Italica themes are fully responsive and every their detail has been tested to fit in on different screens. Moreover, the themes are SEO-optimized and built in compliance with Google guidelines for websites. Fill metadata and keywords and be surprised by your high position in search engine search results. 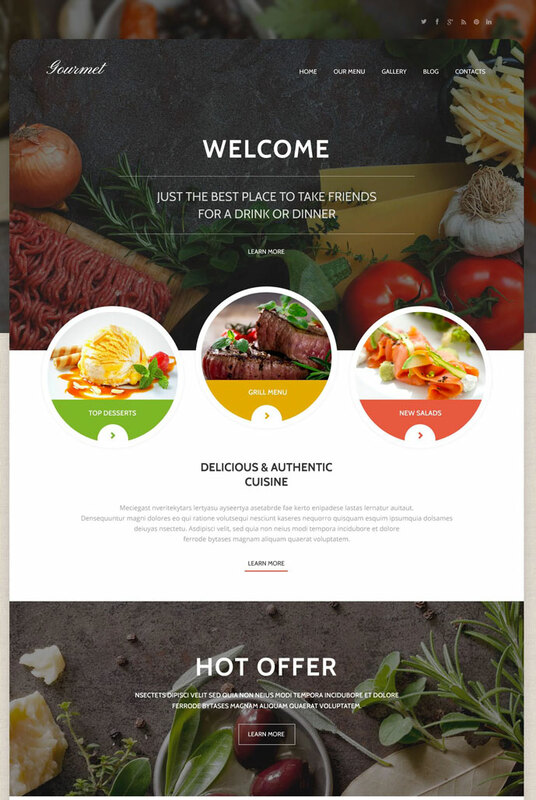 This responsive and cross-browser compatible WordPress theme is designed for fast food restaurants serving burgers, pizzas, salads and different sandwiches that we all love so much. You can build the menu of your place with easy-to-manage Restaurant Menu plugin. Display your menus in posts, pages and sidebars and stimulate the appetite of your guests by this. You can not only provide the basic information about the dish, but include all what your clients may need to know from nutritional data to size and weight of the dish. Custom widgets that are incorporated in the template enrich its functionality and can be used in sidebars of your website pages, in footer and on your home page. Template header features you contact data and physical address, as well as your opening hours, so that clients can find them right away. Social buttons are also situated above the fold, which helps you gain more followers in social networks, such as Foursquare, TripAdvisor, Twitter, Facebook and Google+. Google Map is handily located in the template’s home page footer, which lets your site guests find your place right when they land on your website. If you want to share your cooking passion with the world, this Cookery Book template is ideal for featuring great recipes adorned with photos and videos. The blog page of the template has a number of layouts available, such as listing, grid or masonry, so you can choose the one that best fits your needs. The design of the template is creative and quite unconventional. It features a drop-down sidebar menu, hi-res background images and CSS-powered hover animations. The template is based on CherryFramework 5, the latest version of this sound and feature rich framework. Cookery book is also built with Bootstrap 4, and, thus, it works great on every device and screen resolution. 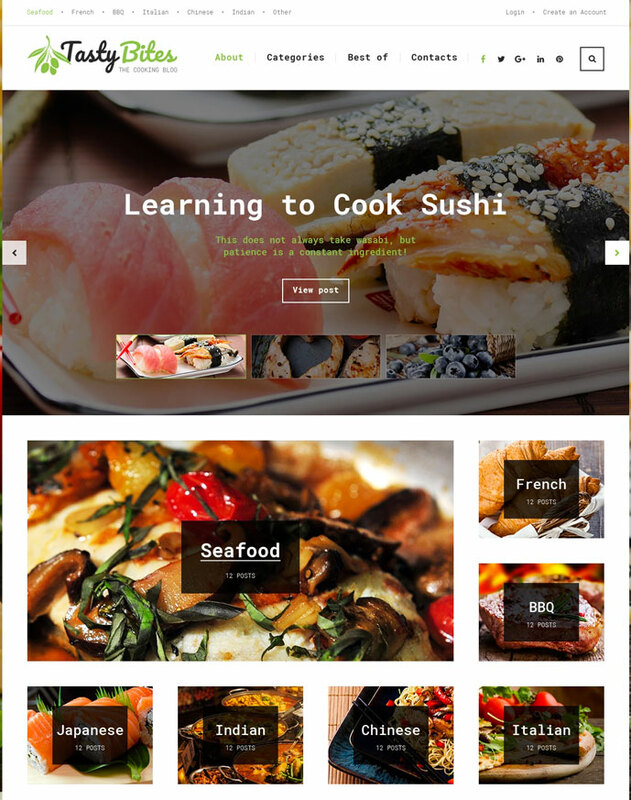 With Cookery Book template, theme editing and content management requires no coding skills. Live Customizer and Power Builder are the two template’s visual editors that provide for simple and intuitive customization on the fly. 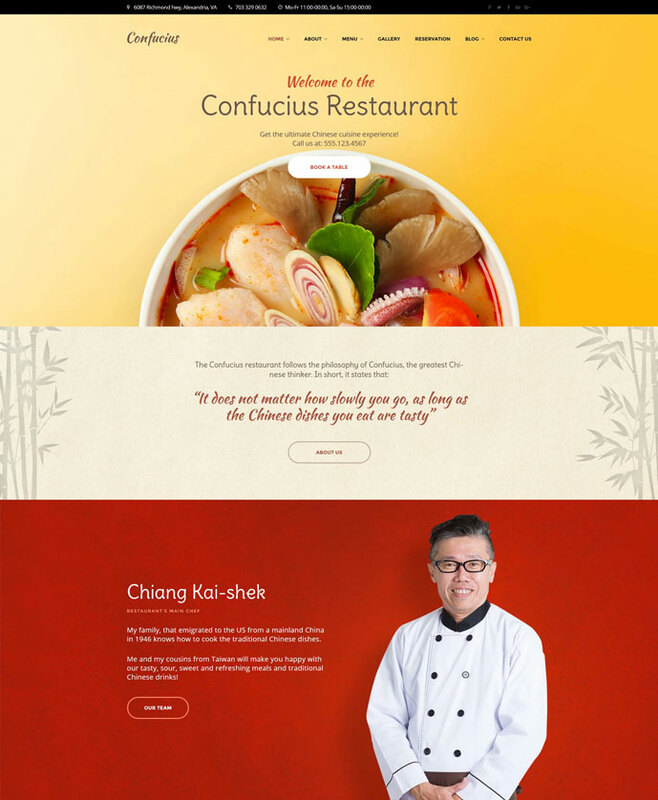 If you have a restaurant that serves Asian cuisine, this template, full of oriental flavor and magic, will let you create a website of your dream. Your informative home page features fullscreen booking section that invites to book a table right after your site guests land on your website. Appointment Manager plugin that facilitates booking functionality on your website is fully responsive and site visitors can reserve tables on the go. On the home page, there are also Awards and Testimonials sections that show that you are acknowledged on restaurant review portals and loved by people who visit your place. Template’s feature-rich gallery is ideal to showcase not only your eye-pleasing dishes, but also your venues and kitchen. As to the customization of your website, you can rebuild it up to your desire with drag-n-drop Power Builder that has an inbuilt library of layouts. If needed, you can create your own layouts as well. Power Builder also provides for filling your layout with content of different content types and ensures best presentation of the information that you want to share with people. This Japanese Restaurant template utilizes red color that is traditional for Far East cultures. Moreover, red color is known to stimulate the appetite, so, this is right what you need. 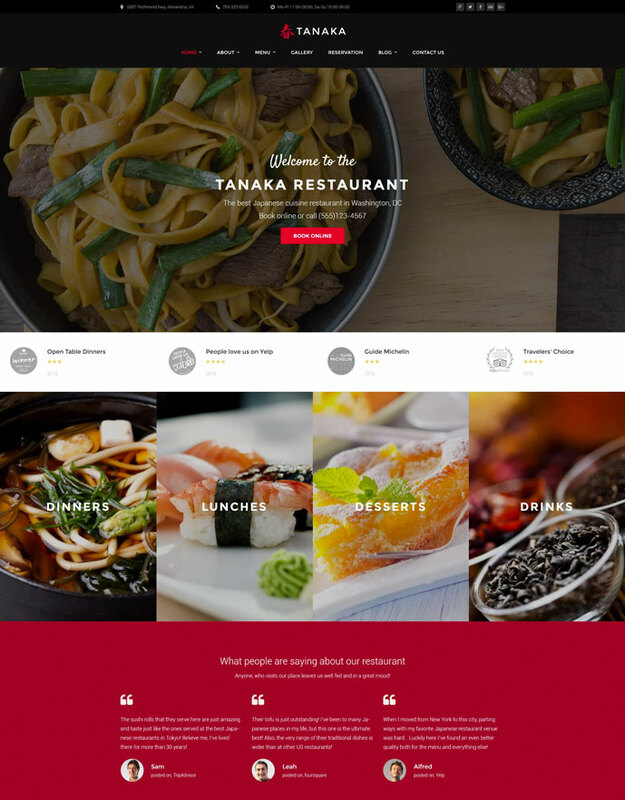 This Japanese Restaurant WordPress Template offers you rich typography options with 500+ Google fonts available, ultra-responsive design and flexible layouts that use Bootstrap grid. You do not need to be a web design expert to customize this modern template up to your needs. With the inbuilt page builder you can rearrange blocks and add content to different positions with simple drag-n-drop. Traditionally, the template code is valid, clean and well-structured. This ensures the sound and secure base of your template, as well as better position in search engine search results. The template is additionally SEO-optimized to fit the Google guidelines for websites. 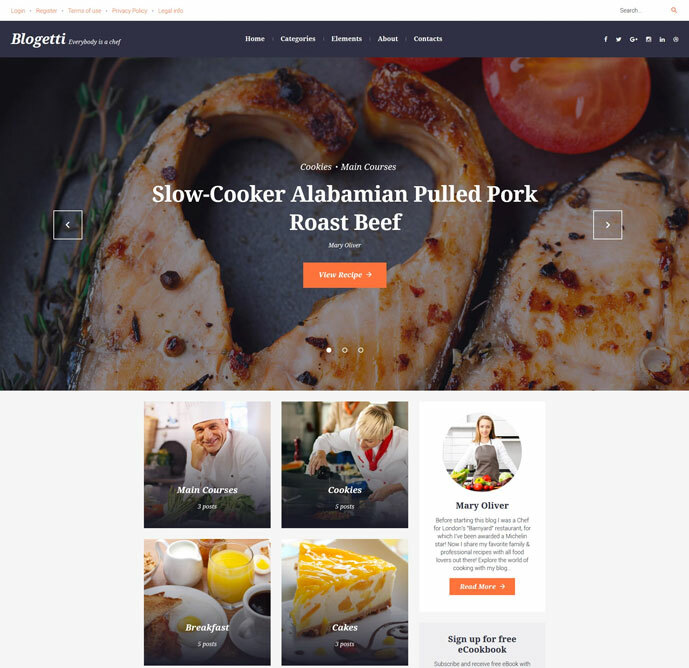 If you love cooking and want to share your passion with the world, then, Blogetti template is the one that will let you become a popular food blogger. The theme has simple and intuitive navigation and your website guests will never be lost, no matter what they want to find on your website. Blogetti theme offers rich integration with social networks, so that you can gain a cult following in social networks. Social icons, such as Facebook, Twitter, Instagram, Google+ and LinkedIn reside in the template’s header and immediately catch site guests’ attention. You can generate leads with newsletter subscription form that invites users to sign up for a free eCookbook by just providing their e-mail. You’ll never be lost editing the template, as it comes with a number of step-by-step tutorials and video-guides. Moreover, with the template you get 24/7 Live Chat and Phone support for lifetime. Need a visually abundant website to ignite the passion of people to Mexican food and make it irresistible to visit your place? 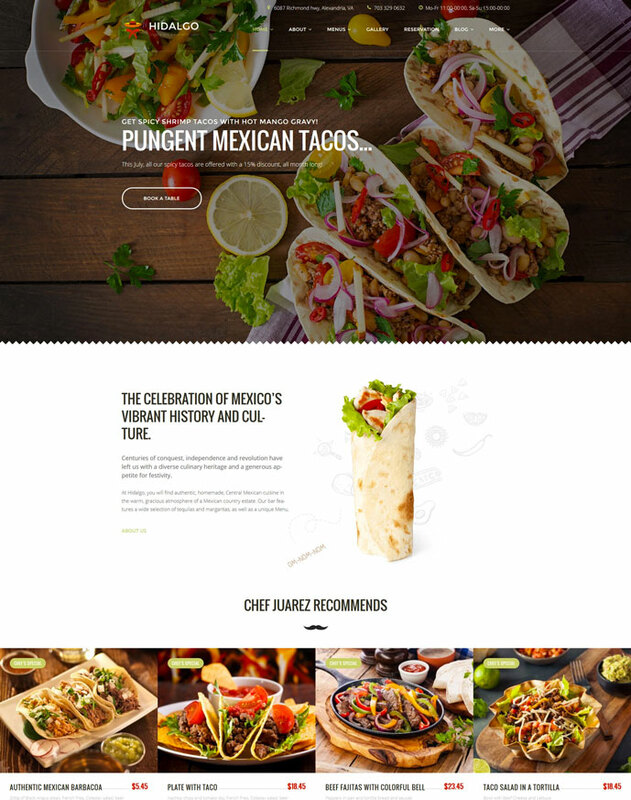 LoveTacos is a top-notch food template that has a thought-out design that combines rich hi-res imagery and minimalistic content sections. With 500+ Google fonts you can choose the one that ensures best readability and fits the design and style of your website. The template comes with a number of prebuilt pages that serve best for the full-blown presentation of your business. These pages are About Us, Services, Team, Pricing and FAQs. The template comes equipped with an easy-to-use menu plugin. With Restaurant Menu plugin, you can include menus to the main body of your pages (e.g. to the home page), to the sidebars and posts, as well as create separate pages dedicated to the menu presentation. The great feature of this menu plugin is that it lets you add full information about the dishes that you serve, including nutrition facts, ingredients, etc. If you want to show that European cuisine is by no means boring, then this light and clean theme is the best fit for you. 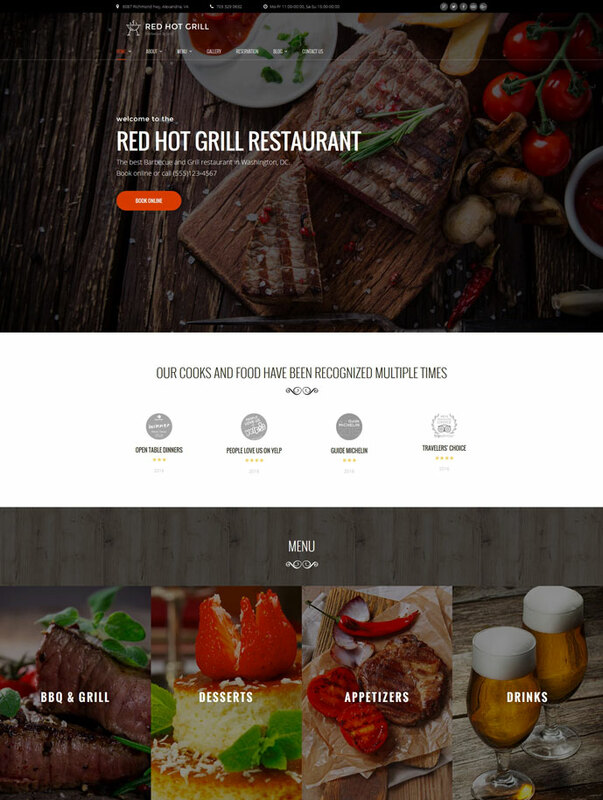 This ultra-responsive and fully editable template is tailored for café and restaurant websites. Site guests will be pleased by attractive website design, underpinned by Parallax effect, background videos, readable fonts and pleasant color palette. Your website will stand out among others thanks to appointment booking plugin. There is no need to fill in the form or make a phone call to reserve a table. Your website accepts reservations any time 24/7. Just choose the time slot available and receive an e-mail that confirms your booking. New gen template customization is provided with the help of Power Builder, a visual editor of outstanding functionality. It invites you to take advantage of 25+ modules, a library of beautiful presets and drag-n-drop functionality. Forget about working with code and edit the template on the fly! How do you imagine a perfect Seafood Restaurant website? If you think that it’s hardly carried out in any other colors than all the shades of blue, you’re completely right. 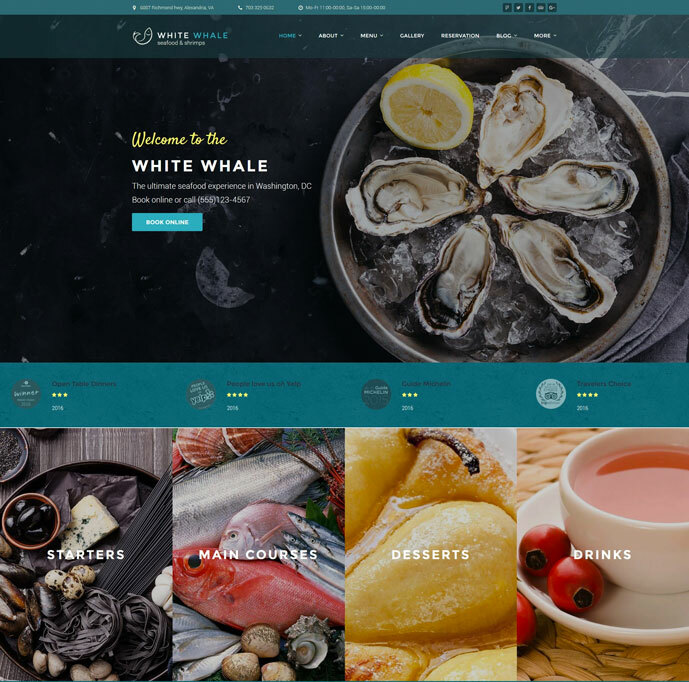 That is why the main color of this template is sea-blue that perfectly matches the HD images of fresh and deliciously cooked fish and sea products. 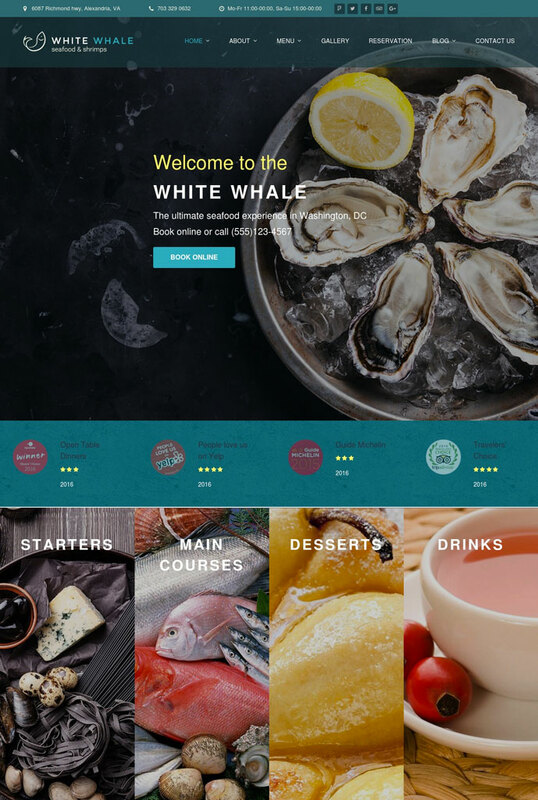 This Seafood Restaurant theme is not only visually appealing, but is also user-friendly. All the seafood lovers can learn all the details about the dishes you serve with MotoPress Restaurant Menu plugin, as well as make a reservation directly on your website using booking functionality that your website offers. In terms of customization, this template offers you rich set of options available in the admin panel. You can preview the changes live. There is no need to constantly save changes and reload the page. All of us, who has at least once been to Italy, can never forget its festive, sunny views and unforgettable flavor of fresh and delicious Italian food that fills all around. If you want to create the same atmosphere on your website, then this clean and balanced template is the best fit for you. Some of its sections have a clean white background, others create 3D depth with skeuomorphic texture-rich wooden backgrounds. You won’t be disappointed with the functionality of the template. Its navigation is implemented with the help of MegaMenu, a plugin that allows creating informative menu panels that include not only pages, but also categories, widgets and images. Such a MegaMenu panel allows you to include elements of different types to your navigation, so you can include there what you want and forget about limitations. Little Italy template is WPML-ready. This means that you can translate your website to different languages and place a language switcher in website header using WPML plugin that is the most popular translation plugin for WordPress. 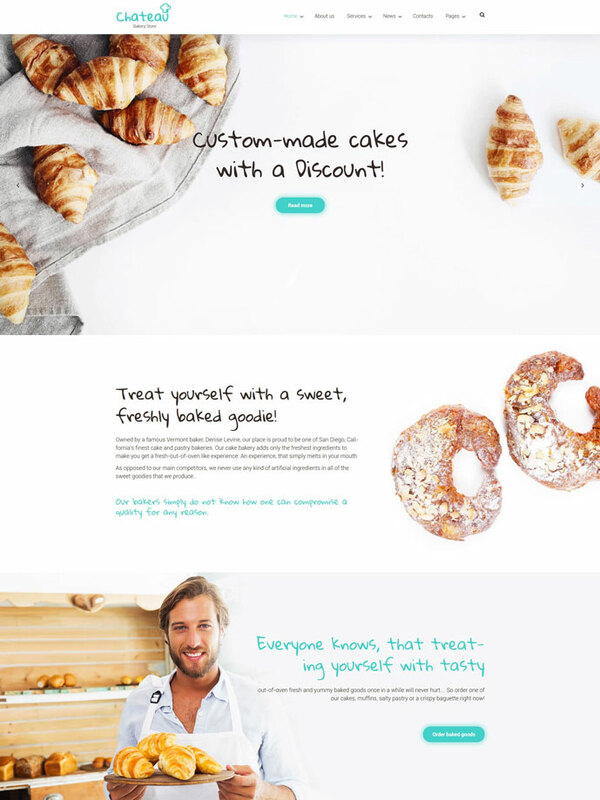 This upbeat bakery template meets all the standards of 2017 web design. Your website will be equally attractive, no matter if your website guests use smartphones, tablets or PCs to view it. It’s also cross-browser compatible. Google Chrome, Mozilla Firefox, Safari, latest IE – this Bakery WordPress theme will display right the way you see it in all of them. Template’s code is written in accordance with latest HTML5/CSS3 standards and well-commented. However, do not think you’ll ever have to work with it. The template comes with intuitive WYSIWYG Page Builder, where you can move the blocks of your template around and fill them with content of different types. The 25+ content modules included to the template allow you quickly add buttons, accordions, CTA buttons, countdown timers, bar counters, dividers and many other website elements. Do you feel puzzled with the perspective of creating a website serving Jewish traditional food? You have the reason for this. 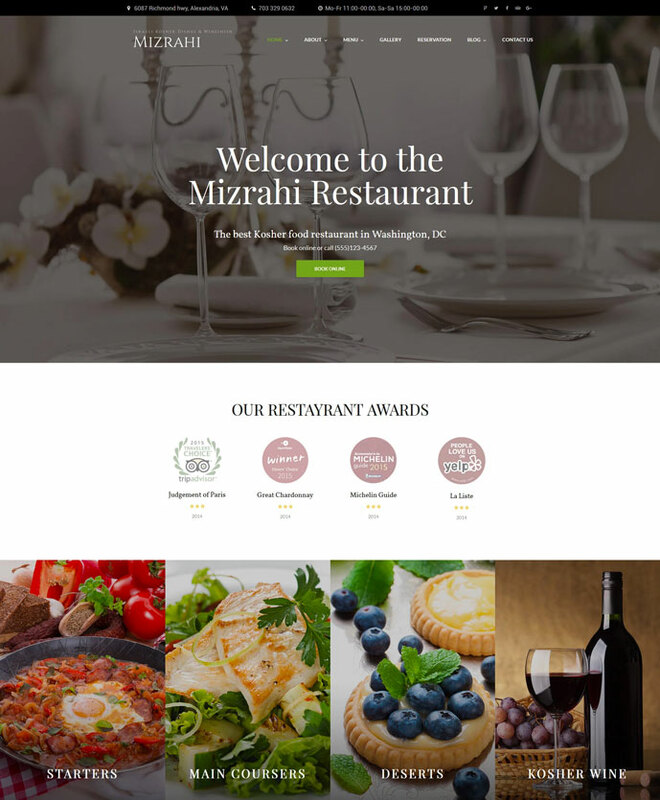 Regular Café and Restaurant template will need a lot of work to turn into a perfect Kosher website. 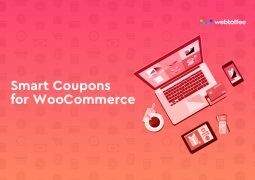 That is why this theme may be a real bounty for you, as it already has all you need and lets you create a website that will be loved by Jewish community. The style of the template is reserved and welcoming. On the website pages, site guests will find pictures of your interiors and of the dishes and drinks you serve, as well as awards, customers’ testimonials and your full content information with GoogleMap. Other template features include Power Builder, Live Customizer, MotoPress Restaurant Menu, Appointment Manager, etc. The template is distributed under GPL3 license, which means that you buy the design once and use it forever. 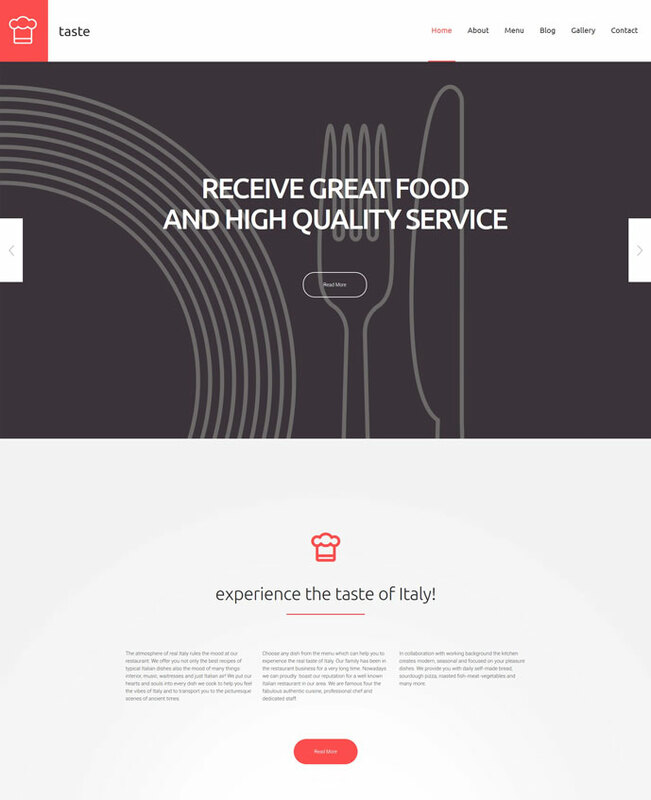 This elegant responsive Italian Restaurant template ignites the appetite with its rich color palette and HD images. The background of this WordPress theme is filled with stylish rich-looking textures, and the font used adds even more luxury and exclusivity to its look. The template is responsive and Retina-ready. You can take care of intuitive, streamline navigation of your website by using MegaMenu panels instead of regular menu dropdowns. Such a menu not only provides for simpler website navigation, but also adds some aesthetics to the menu presentation with the use of widgets and images in the menu panel. You can edit the template with MotoPress WYSIWYG editor that spares you form editing template code that is a pretty hard task for newbies. The template lets you create an appealing and thought-out menu page with 4 layout types available for it: masonry, grid, list and justified. Choose the one that best fits your needs and enjoy the new opportunities that your website brings you. 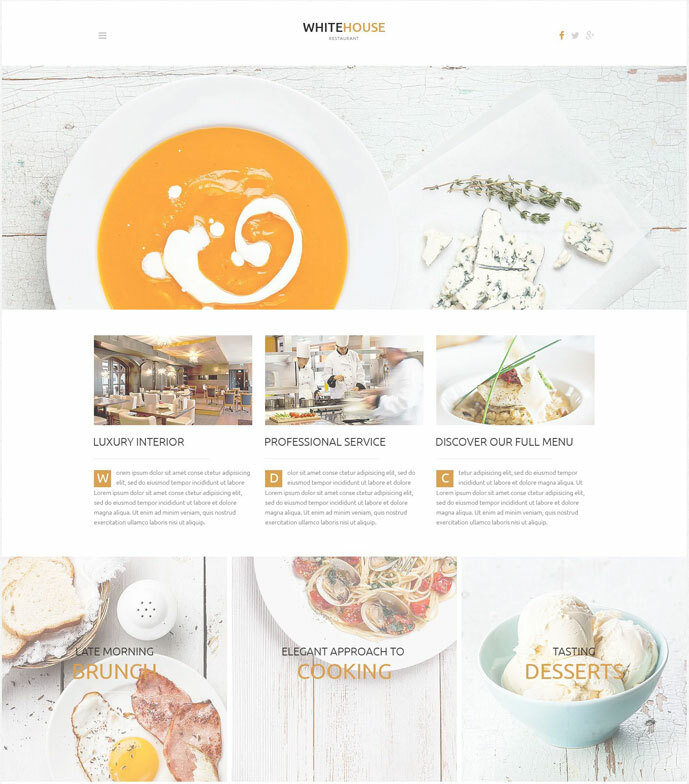 This food blog template in off-white shades lets your site guests center on website contents and juicy imagery of your website, rather than be distracted by visual noise. Built with Bootstrap 3, the template perfectly adapts to different screen resolutions and looks great on every device from a smartphone to a desktop PC. It features clean, readable and easy-to-modify code, and, by this, ensures best website position in search engine search results. With Live Customizer the template’s layout can be tweaked by the users of all levels with no extra effort. Moreover, the template offers rich media integration, allowing you to embed YouTube videos, audio podcasts and media galleries to your website. HealthyVeg template is distributed under GPL 3 license. You can install it multiple times on an unlimited number of domains, as well as modify and share its code with no restrictions. With HealthyVeg you can achieve literally everything you want and launch a food blog of your dream! This template has an unusual minimalist design that makes use of icons and symbolic depictions rather than of lush imagery. And this is what makes it different from the majority of posh restaurant websites on the net. With this template, you will sound human and people will feel comfortable reaching you out. With more than 500+ Google Fonts, you can not only ensure perfect readability of your content, but also add a personal touch to it. The template is mobile friendly, so catering can be ordered even on the go and this requires only a couple of clicks. You have a chance to provide information about your dishes on the Menu page and showcase them in full blossom on the Gallery page. 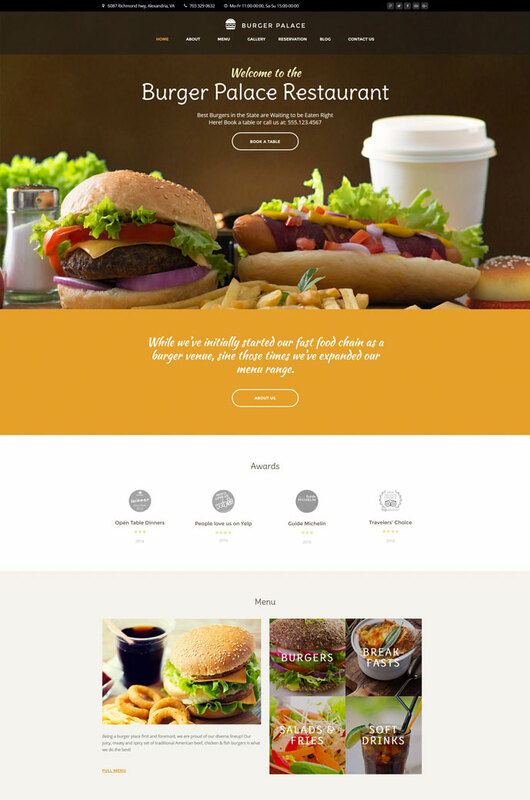 This Catering WordPress template is optimized from the SEO perspective. It provides rich SEO-options and lets you rock the first page of search results. If food is your passion and you love sharing this passion with the visitors of your place, then, let your website be a sound statement of this. 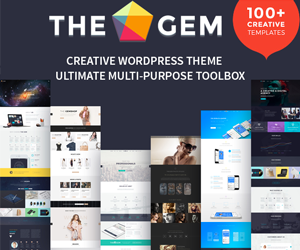 This theme is full of action and dynamics: it features bold, big fonts, image grids and cards and lets you emphasize what matters here and what doesn’t. As the site guests lend on your website, they immerse into the fullscreen image that immediately captures their attention. The main menu of the template has lowered position and is situated below the fullscreen image. To enrich your website, you can add media content to it. The template allows adding the following posts with media files: image post, gallery post, video post and audio post. To show how this or that exquisite dish is cooked by your chefs, you can embed a YouTube or Vimeo video to one of your website pages. Work with your website content using MotoPress visual editor that comes with the template, and you’ll never have to edit a single line of code. If you run a restaurant that serves traditional Chinese cuisine, you need to go for design that breathes of the history-long values of this culture. This Chinese restaurant template is utilized red highlights and bamboo backgrounds that show visitors that you preserve the best traditions of Chinese cooking. This template has clean design and rich functionality that will take your business up a notch. The plugins that the template offers are: Power Builder, Appointment Manager, Restaurant Menu and Live Customizer. 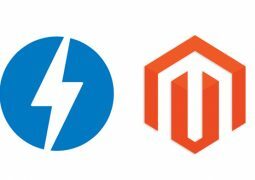 These plugins are prebuilt, and this means that do not need to speed even a cent on top of the template price to power a restaurant website with rich functionality. Editing the template is so simple that you’ll have fun when customizing your website. Live Customizer offers you a rich template editing interface and allows you to preview all the changes in live mode. The theme also comes with the library of built-in layouts that let you experiment with your page structure using Power Builder. The theme is responsive and cross-browser compatible, providing for perfect display on different screens and in different browsers. This Barbecue Restaurant theme irresistibly ignites appetite with its images of meat and rich sauces. This imagery is supported by Parallax effect and lightbox animation to make users hover content elements and explore more. The template comes with Appointment booking plugin that allows everyone who wants to dine at your place to book one of the tables online. Restaurant Menu includes all the information about the dishes you serve, as well as the prices. This is extremely convenient for site guests, as many people are often reluctant to visit the place that hides its prices online. 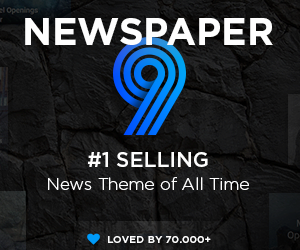 The template is packed with a rich set of pre-made layouts and widgets. They let you experiment with site blocks, and set up different layouts for mobile, tablet and PC viewports. 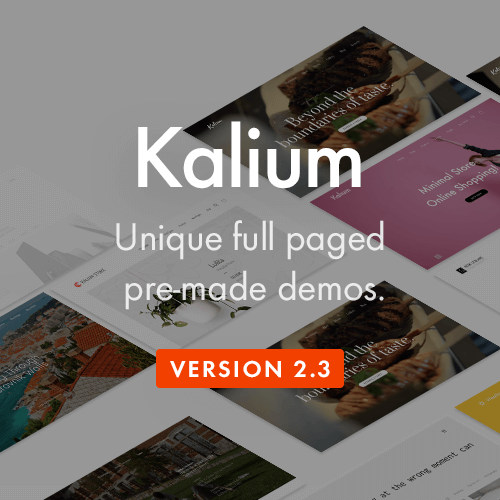 Preview the changes without reloading the page with Live Customizer, and enjoy the freedom this template gives you for implementing your vision. If people visit a café or a restaurant, this is not only about the food, this is also about the atmosphere of your place and about the careful attention and high-quality service they receive. This template is created to reflect upon the quiet, welcoming atmosphere of your place and is bound to make a good first impression. The theme is fully responsive and adapts to all the viewports from a smartphone screen to a desktop PC. Moreover, all the template images are Retina-ready, ensuring a stunning appearance on Retina devices. Template’s home page has an immersive fullscreen background, where you restaurant’s logo takes the main part. To unfold the menu site guests need to press the corresponding button. After they navigate to one of your website pages, they will see the standard layout of your website with the menu handily placed on top right. When customizing the template, you can use the inbuilt MotoPress editor and edit the template with simple drag-n-drop. 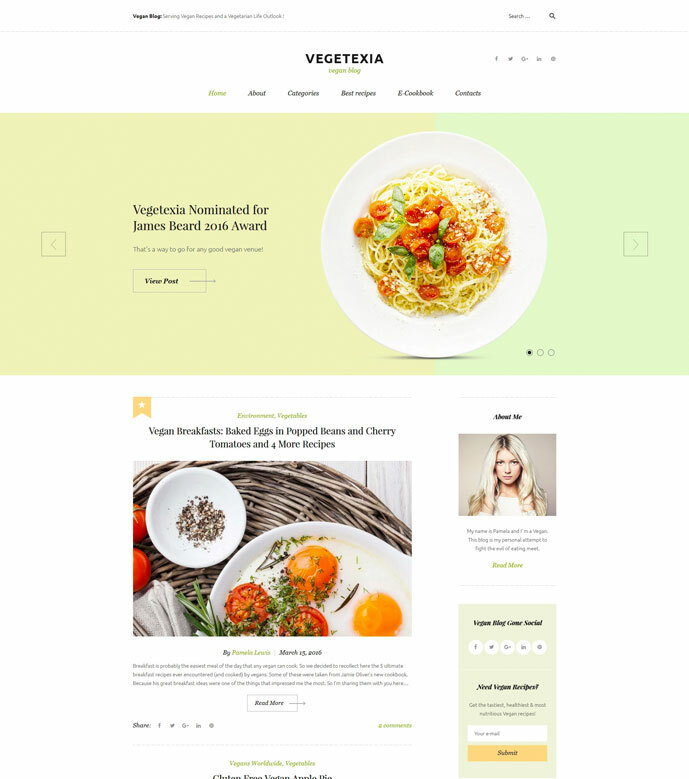 This food store WordPress template is carried out in the neutral green shades that are friendly to the eye. 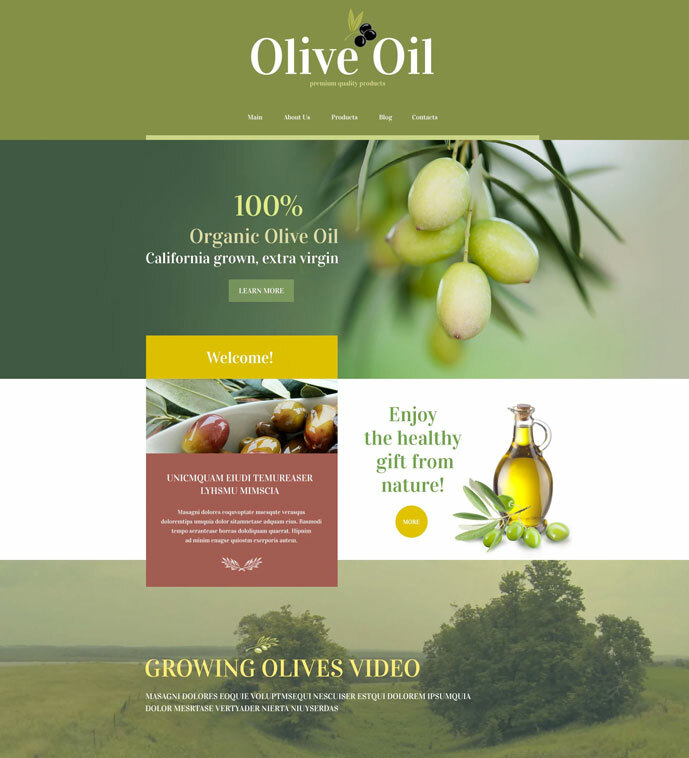 The theme is tailored for an olive oil shop, but you can use it to create a food store of any other kind. The theme is responsive and looks equally great on small (smartphone), medium (tablet) and large screens (desktop PC). On the mobile screens template main navigation appears in form of a dropdown. The home page of the template features an animated fullscreen slider. This slider is ideal for showcasing you promos, best offers and new products. With the Categories widget, you can display the categories of the products you offer on the left to let users see the diversity of your inventory. The bottom part of the home page invites site guests to subscribe for your newsletter. Just an e-mail address is needed. In the website footer, users can find your contact details, Google Map with your physical location marked on it, and social buttons that let people follow you in social networks. Not everyone can afford to travel to Italy, to enjoy delicious pasta and ravioli. 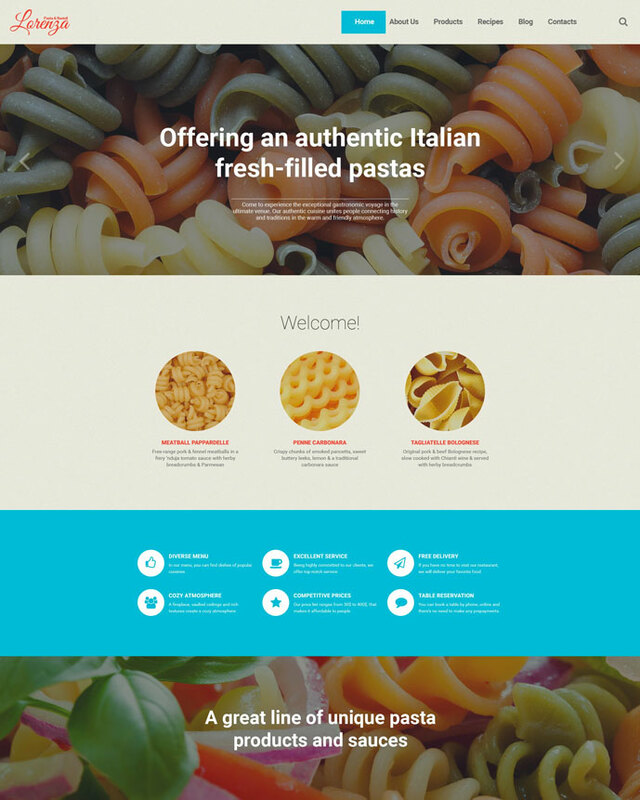 With this template you can launch a pasta store website and bring marvelous Italian delicacies to every house. Clean and elegant, this theme makes a special emphasis on mouthwatering images of your products, many of which are displayed with Parallax effect. The template is based on CherryFramework. This feature-rich framework is solid, simple and accurately structured. It provides you powerful Bootstrap options and makes your website seamlessly adapt to different screen resolutions. MotoPress Slider that is included to the template allows you create professionally looking slides that combine images text and buttons. Sprinkle your slides with transition effects of your liking and make your slider one of biggest attraction of your website. 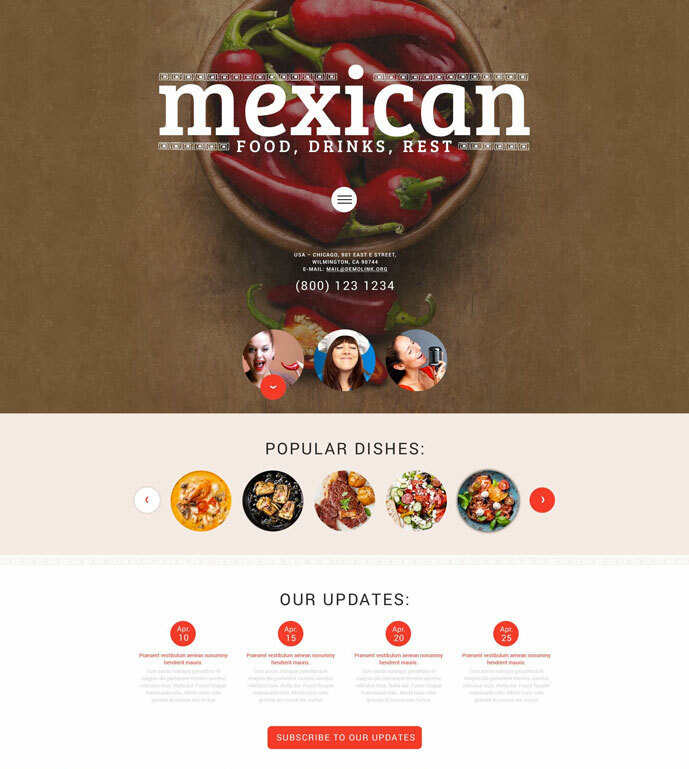 In search for a rock-solid solution for your Mexican food website, this template will become a real discovery. It features extra-bold typography to make a sound statement and embraces modern web design trends. The template’s home page immediately captures attention with its top fullscreen image. Home page banners and images of popular dishes have round shapes that fit the overall modern design of the template. With this theme, you can work with custom post types and formats. They include such options as Standard, Aside, Gallery, Link, Image, Quote, Audio, Video, etc. To add content to your website pages, you can use of 80+ shortcodes that are included to the theme. Just press the Shortcodes button and choose the one you need in the dropdown. This template is the right choice if you need a visually rich modern Mexican food template that is a real pleasure to customize! If you need a responsive cafeteria template that reflects on modern web design trends, then this is right the template you need. 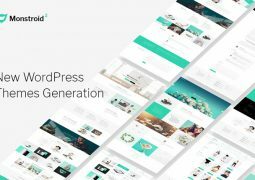 One of the Monstroid templates, it comes with 20+ prebuilt plugins that power a website of incompatible functionality. Moreover, this template has an inbuilt auto-updater. As soon as a template update is released, the update is automatically downloaded to your admin panel. NiceCafeteria template is responsive and Retina-ready, so it looks awesome even on displays with high pixel density. The theme also uses MegaMenu instead of the commonplace menu dropdowns. Such a menu displays a panel with elements of different types that you include into it. Your site guests will be able to navigate not only to your website pages, but also to categories and even to single posts. 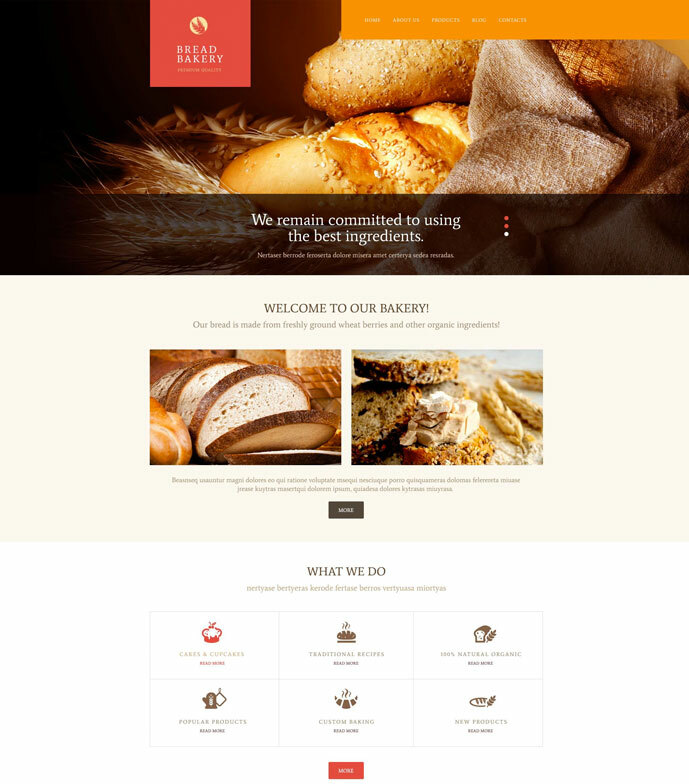 This Bakery WordPress theme has a highly customizable design and can be used for different food-related websites. To work with the template, you do not need to be a web design expert. Even the newbies will be able to handle theme customization, as all the changes are applied via intuitive admin panel. You can install the template in 2 steps and make use of the inbuilt Theme Customizer later on. The template offers you multiple color options, advanced slider, filterable portfolio and rich typography. There are more than 600 Google fonts available that will display the same way in all modern browsers as the theme is cross-browser compatible. It also comes with free lifetime updates and advanced backup options. Having a backup of your website is very important as you can be sure that you will be able to revert changes when needed. This template has clean white design, which makes your dishes even more appetizing. With it, you can not only present your dishes, but display them with all the necessary information and prices. Your website will load quickly thanks to LazyLoad plugin. With this plugin, images load as site guests scroll the page and appear with animated effects. In this way, LazyLoad not only boosts website loading speed, but also makes you pages even more enticing. The template also includes custom widgets for more diverse content presentation and effective social sharing. This Restaurant WordPress theme is translation ready. Translations are carried out with WPML plugin that is one of the most popular plugins for making your WordPress website multilingual. 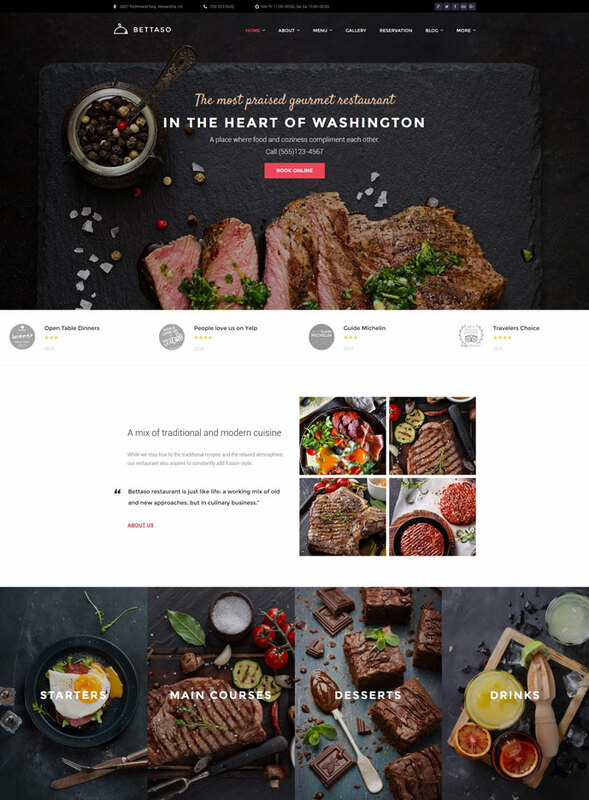 CentralFood is a beautiful template that will compliment the image of every modern restaurant or café. Its homepage opens with a fullscreen image depicting delicious food. Below resides the menu bar that sticks to the top as guests scroll down the page. Home page blog section has a masonry layout, where image blocks are intermingled with text blocks for a captivating visual effect. The theme is fully editable. It allows you to work with different post formats and 80+ shortcodes. Moreover, the template is translation-ready and SEO-friendly. It has valid HTML5 and CSS3 code and offers you additional SEO options in admin panel. That is why expect to see your website on the first page of search engine search results! I hope you enjoyed reviewing this collection of amazing food and restaurant WordPress themes. If you want use MotoPress Restaurant Menu Plugin in Grilly theme, you can read the full documentation here. The documents will guide you step by step to setup MotoPress Plugin. Alternatively, you can also use built-in Visual page builder in the Grilly to make your own Restaurant menu.